In the 3 September Victory Day Military Parade in Beijing that marked the 70th anniversary of the end of WWII, the Second Artillery Corps (SAC) of the People’s Liberation Army (PLA) formed six formations in the ground mobile column, featuring seven models of its DF — “Dong Feng” family of theatre and strategic missiles. These missiles cover all categories of the Second Artillery Corp's current inventory, ranging from short to intercontinental range, from ballistic to cruise missiles, and from nuclear to conventionally armed. The missiles featured in the parade include the DF-15B short-range ballistic missile (SRBM), the DF-16 SRBM, the DF-21D anti-ship ballistic missile (ASBM), the DF-10A land-attack cruise missile (LACM), the DF-26 intermediate-range ballistic missile (IRBM), the DF-31A intercontinental ballistic missile (ICBM), and the DF-5B ICBM. Among them, only the DF-15B and DF-31A were featured in the previous parade in 2009, whereas the remainders were all unveiled to the public for the first time. The DF-15 is a conventionally armed, solid-fuel, mobile launched SRBM system, designed by the CASC Academy of Aerospace Solid Propulsion Technology (AASPT, or 4th Academy). First introduced in the late 1980s, the missile was originally intended for the export market under the designation M-9, but was subsequently adopted by the PLA Second Artillery Corps in the 1990s for conventional strike role. The DF-15 became famous during the 1995—96 Taiwan Strait Crisis, when the PLA launched a number of DF-15s into the public waters near Taiwan. The basic variant DF-15 was essentially a single-stage rocket with a primitive inertial guidance package (250–300 m CEP), making it only suitable for attacking large fixed area targets such as an airport or naval base. 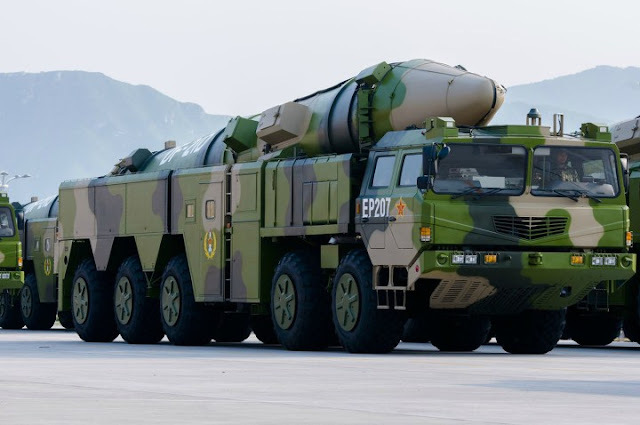 The PLA has subsequently introduced the improved DF-15B that featured sectored control fins, GPS midcourse correction, terminal guidance, and control fins on the re-entry vehicle. 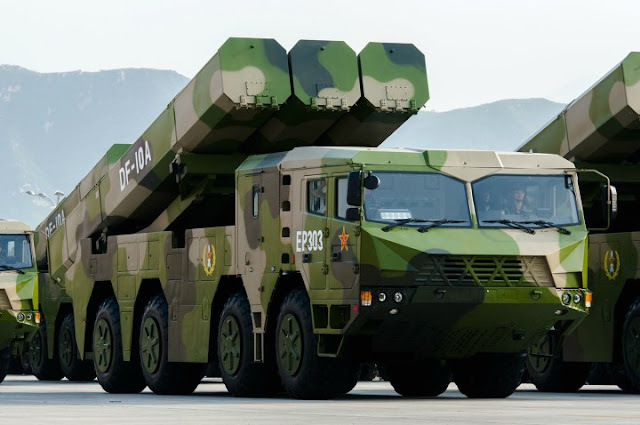 Its accuracy was said to have dramatically improved to a CEP of 50–100 m.
First unveiled to the public in the National Day Military Parade in 2009, the DF-15B is carried on a four-axle transporter-erector-launcher (TEL) built by the CASC Tai’an Special Vehicle Corporation. The missile carries a single 500 kg conventional warhead and has a maximum range of 600–800 km. In time of crisis the missile system could be quickly mobilised from bases to launch locations via railway. The TEL then carries the missile to the launch site. The 2010 U.S. DoD Report on the PRC Military Power estimated that 350–400 missiles and 90–110 launchers were in operational deployment with the PLA Second Artillery Corps, though this number may have increased significantly since then. The second SRBM system featured in the parade was the DF-16 (CSS-11), a new design unveiled to the public for the first time. Jane’s Strategic Weapon Systems first reported in September 2012 that China was developing a new short- to medium-range ballistic missile designated DF-16 as a successor to the older DF-11 (CSS-7, M-11) and DF-15. The 2015 U.S. DoD Report on the PRC Military Power mentioned the DF-16/CSS-11 for the first time, stating that it was in operational deployment. The DF-16 was described as a conventionally armed, mobile-launched, two-stage, solid-fuel ballistic missile with a range of 800—1,000 km, enough to reach whole of Japan as well as U.S. military bases in Okinawa. The missile is expected to be fitted with an Inertial Navigation System (INS) coupled with GPS mid-course guidance, as well as a terminal guidance system to achieve a CEP of 5—10 m, enough for precision strike against a point target. The missile is carried on a five-axle Sanjiang Corporation TEL as opposed to the four-axle TEL used by the DF-11 and DF-15, indicating a significant increase in launch mass. The 17th formation of the ground mobile column in the parade featured the DF-21D (CSS-5 Mod 5) anti-ship ballistic missile (ASBM), the world’s first weapons system potentially capable of targeting a moving aircraft carrier strike group (CSG) from long-range, land-based mobile launchers. China has long been rumoured to be developing its DF-21 (CSS-5) medium-range ballistic missile (MRBM) into a unique anti-ship weapon system dubbed the “carrier killer”. A U.S. Navy senior official revealed in December 2010 that the Chinese ASBM system had reached equivalent of “Initial Operational Capability” (IOC), but the Chinese military had never officially confirmed the existence of such a weapon system until now. According to limited public information sources on the ASBM system, the missile is launched from a land-based TEL and flies over a distance of 1,500—2,000 km to strike naval targets. The missile would initially rely a system of systems consisting of land-based over-the-horizon radar as well as air- and space-based sensors to locate and track its target. Once the missile re-enters atmosphere, it would switch to its onboard optical/radar terminal guidance and approach the target at a terminal velocity of Mach 6 or above, making it highly difficult to be intercepted by enemy’s air/missile defence system. A test launch of the DF-21D against a land target was reportedly conducted in the Gobi Desert in January 2013. Some analysts still have doubts over the effectiveness of the ASBM system against a moving target in the sea, and whether the missile’s ‘kill chain’ involving multiple land-/air-/space-based sensors can survive enemy countermeasures until the missile reaches its target. Nonetheless, the official debut of the DF-21D suggests that the PLA is confident enough to deploy the missile for operational use. The 18th formation featured the DF-10A LACM, possibly a derivative of the CJ-10 (Chang Jian-10) LACM displayed during the National Day Military Parade in 2009 with improved range and accuracy. Chinese military planners watched closely the employment of the Tomahawk LACM by the U.S. military in Kosovo, Iraq, and Afghanistan, and began to develop its own LACM in the late 1990s. The first Chinese LACM design, reportedly designated DH-10 (Dong Hai-10), was believed to have been developed from the Russian Kh-55 (AS-15 ‘Kent’) technology. 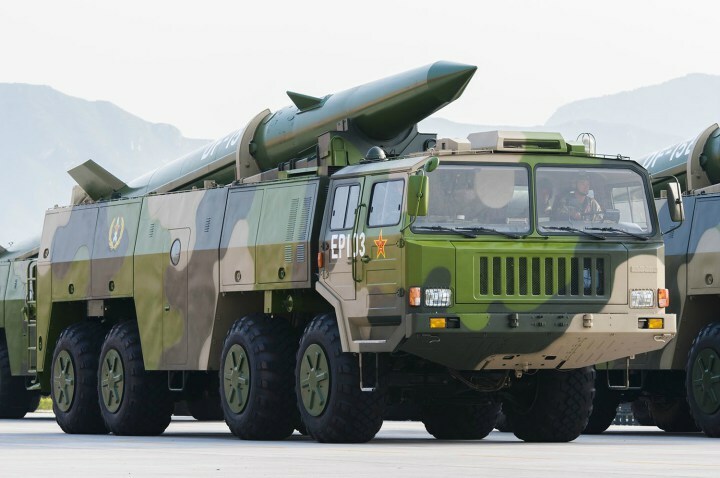 The DH-10 was reported to be capable of delivering a 500 kg conventional warhead over a distance of 1,500 km, with a CEP of 10 m. The missile was first delivered to the PLA Second Artillery Corps in 2006 and was unveiled to the public for the first time in the 1 October 2009 military parade under the designation CJ-10. The DF-10A LACM featured in the 3 September military parade featured a new four-axle TEL, and a slightly different arrangement in the layout of the launcher boxes. An air-launched version of the CJ-10, under the designation of CJ-20, is being deployed by the PLA Air Force (PLAAF) on its Xi’an H-6K medium-range bombers, which was also featured in the 3 September parade in its air display column. A shipborne version of the missile was reported under test in 2012. The most prominent revelation in the 3 September Military Parade was the DF-26 IRBM. The existence of this new missile system was first revealed by the Washington Free Beacon website in March 2013. The missile is a mobile-launched, two-stage, solid-fuel IRBM system capable of delivering both conventional and nuclear warhead. The DF-26 was nicknamed the “Guam Express”, referring to its estimated range of 3,500—4,000 km, enough to reach the second island chain in the Western Pacific and U.S. military bases on the island of Guam. The most astonishing revelation about the missile came from the commentator during the live TV broadcast of the military parade, who said that the DF-26 could conduct precision strike against both crucial land targets as well as medium and large naval vessels. 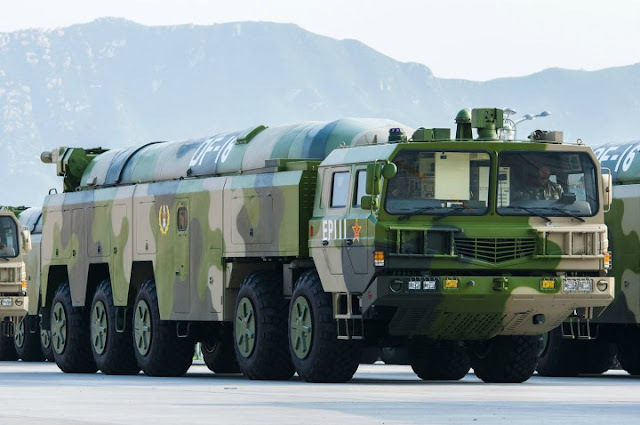 The introduction of a second conventional ASBM system has extended the outer edge China’s layered defence posture against potential offshore threats far beyond the previously estimated 1,500—2,000 km range offered by the DF-21D. The 20th formation featured the DF-31A (CSS-9, Mod-2), a road-mobile, nuclear-armed, three-stage, solid-fuel ICBM system that entered service with the Second Artillery Corps around 2008. The missile was an improved variant of the DF-31 ICBM introduced in the 1990s. Despite the various speculations about the DF-31A’s MIRV capability, it is believed that the missile only carries a single 1MT yield thermonuclear warhead, with an estimated range of 10,700~11,200 km. The DF-31A was first unveiled to the public in the National Day Military Parade in 2009. The U.S. DoD Report on the PRC Military Power in 2009 estimated that around 15 missiles were in operational service with the Second Artillery Corps. The last formation of the SAC featured the DF-5B (CSS-4 Mod 3) ICBM, a silo-based, two-stage, liquid-fuel ICBM system with an estimated range of 10,000–13,000 km. The original DF-5 developed in the 1970s was China’s first ballistic missile system to be capable of reaching targets in North America. It also formed the base rocket for China’s Chang Zheng (CZ, or Long March) 2/3/4 families of space launchers. 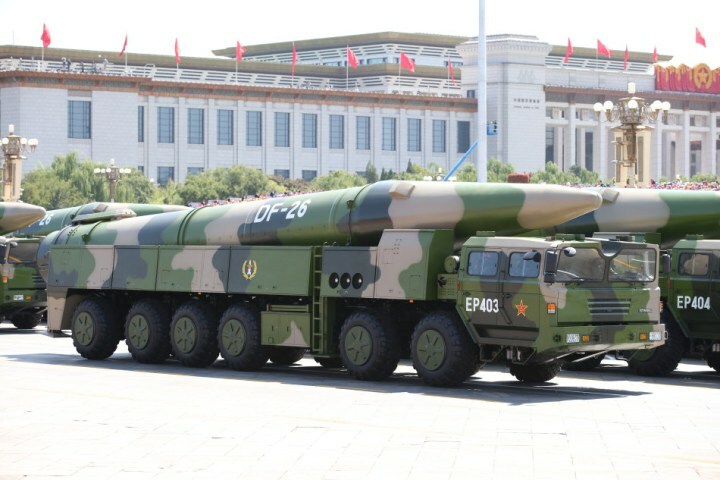 The missile was first displayed in the 1984 National Day Military Parade. The latest B variant of the DF-5 is believed to have been given the Multiple Independently Targetable Reentry Vehicle (MIRV) capability, with each missile carrying three nuclear warheads. The U.S. DoD report on the PRC military power in 2015 revealed for the first time that China had begun to deploy the MIRV-equipped DF-5B. The seven missile types displayed in the 3 September Military Parade reflect the PLA’s continuing trend to develop and upgrade the conventional missile component of the Second Artillery Corps, which was first created two decades ago and now several times as large as the Corps’ nuclear arsenal. The conventional missile force provides an operational-tactical and strategic capability in-theatre without the political and practice constraints associated with nuclear-armed missiles. Secondly, the Corps’ emerging inventory of conventional anti-ship ballistic missile (ASBM) and land-attack cruise missile (LACM) provides the PLA extra employment options in its development of anti-access/anti-denial (A2AD) capability in the Asia-Pacific region. In a potential escalation of a conflict in the Taiwan Strait, the South China Sea, and the East China Sea, the PLA will be more willing to launch a conventional missile strike against U.S. or its allied forces and bases in the Western Pacific region, including potential ASBM series against U.S. Navy aircraft carrier. Thirdly, the missiles in display do not represent all of the latest designs in the Second Artillery Corps’ inventory. 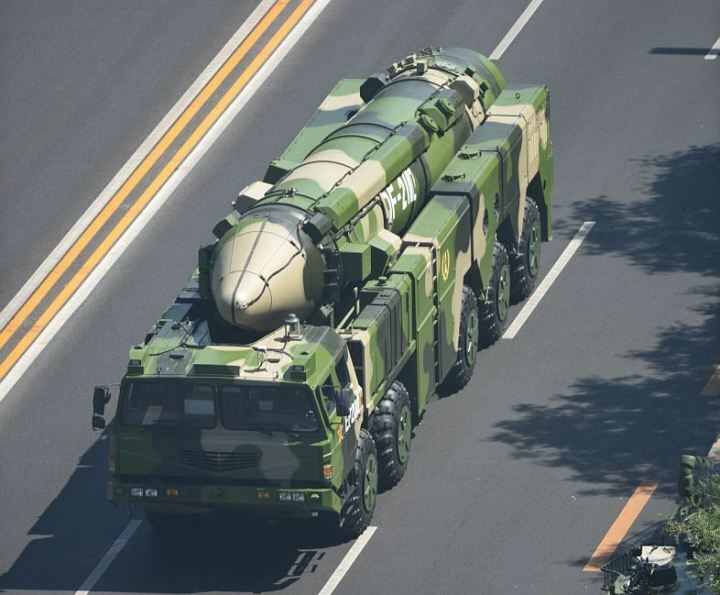 Some even newer missile models, notably the DF-41 (CSS-X-10) ICBM and the DF-31B (CSS-9, Mod 3), were absent in the parade and may have been kept as ‘surprise guests’ for the National Day Military Parade in 2019.